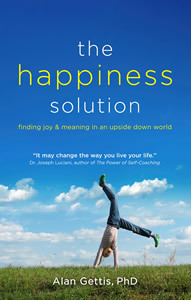 The Happiness Solution: Finding Joy and Meaning In An Upside Down World is based on the groundbreaking idea that healing and happiness come in the form of stories, parables, and anecdotes. They will deal with your thoughts, feelings, behaviors, habits, and traits. They may challenge your beliefs regarding what is connected to happiness. Are you seeking happiness? Finding happiness can be difficult. We have many millions of people suffering from various anxiety and depressive disorders. There is rampant drug abuse and alcoholism, and the divorce rate is sky-rocketing. Prozac, Paxil, Xanax, and Ativan are as likely to be found in homes as are Tylenol and Tums. Happiness is often elusive because we are looking for it in all the wrong places. If you're unhappy, you're about to learn why and what you can do about it. If you're already happy, you're about to learn how to be happier and experience more joy and peace of mind. For mental health in general and happiness in particular. It's a different way of experiencing the world. Weaving the teachings of cognitive behavioral therapy with the wisdom of Zen and various other healing traditions, Dr. Gettis provides a down-to-earth, funny, personal, and scientific exploration of what truly brings happiness. The Happiness Solution! Dr. Alan Gettis has thoroughly researched happiness and what creates it. As a therapist, he works daily to help people remove obstacles to their happiness. All proceeds from the sale of this book go to charity. Please look through the rest of this site and remember to sign up for our free monthly Happiness Solution Newsletter which focuses on keeping you on track and getting you to feel happier and happier. Dr. Gettis is always happy to hear from you to learn your comments. Remarkable. Better than Prozac. I cannot think of a better book on this topic. Dr. Sam Menahem - author of "When Therapy Isn’t Enough"
A unique and compelling read. Highly Recommended!